Many of us want to start their own blog or website on this year 2017. But everybody is not aware of SEO (On page SEO and Off Page SEO). The main goal for the beginner is to rank their keyword on top but they don’t know how to rank keyword or targeted keyword on top. SEO stand for Search Engine Optimization. I know many of you know but the beginner doesn’t about it. SEO simply processes to index your web pages on a search engine like Google/Yahoo/Bing etc. The more your keywords go higher, the more visitors you get on your web page or blog page. Now let’s understand what is on page SEO and Off page SEO. On Page SEO: Means to make all the changes on the website to get the higher ranking, like meta title, meta description, meta keyword, internal page linking and other activities. Off Page SEO: Means to work off side the website to get ranking to SERP, like social bookmarking, directory submission etc. Off page SEO technique helps to build quality backlink and to increase the authority of website and blog. Check more SEO Link Building Methods. 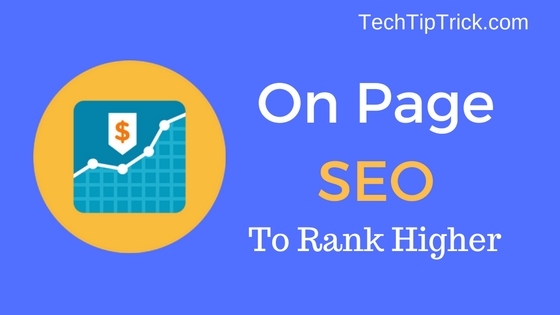 We shared off page technique in our previous post but in today’s post, we are going to share On Page SEO Strategies with you (In deep) to increase your website or blog rankings on SERP. Page titles or post titles is the most important factor of On Page SEO. When you create your website or submit your blog post, make sure to use the keyword on the title. For example, if you are writing about “blogging” then it’s important to use that keyword in the post title. As Brian Dean mention on their On Page SEO technique about post title, start your post title with your keyword that you want to target. This is most important factor for SEO. This way, whenever someone searches on Google/Bing/Yahoo etc. for blogging tips in a search engine, your post has a better opportunity to show on the first page because you have included those keywords in your post title. There are many people forgot to include meta description while posting content and their page can’t rank on higher. Meta description is an important part of SEO. 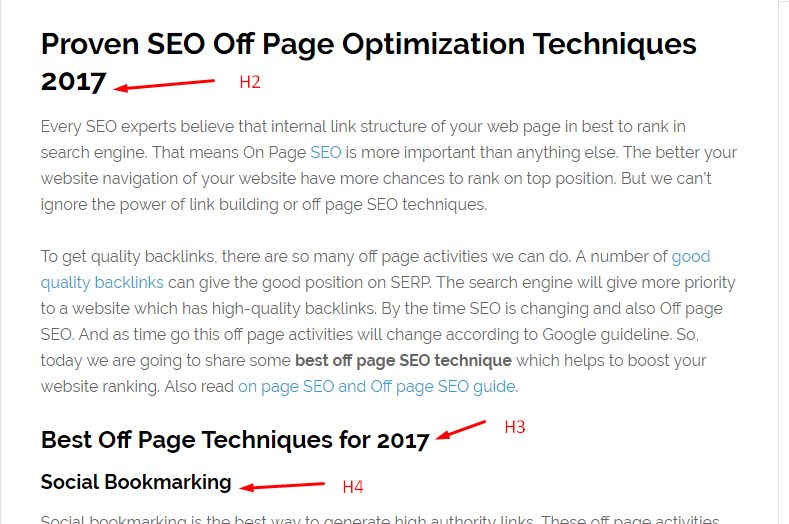 When you add meta description in page or post, you have the opportunity to add keyword variation in the description. The benefits of adding meta description are that when user search with your keyword, your page has better chance to rank. For example, best blogging tips, beginner blogging tips, blogging guide. Search Engine Friendly URL is highly recommended. Google stated that the first 3-5 words in a URL are given more weight, so make your URL short. Check the below image. When you make keyword base URL, you have high chances to rank. Short URL easy to understand for Google. Use your keyword in URL. This will perform well rather than the long title which ends with the keyword. When you post your blog try to use a modifier like, “2017”, “Best”, “Top”, “Review”, “Guide” etc. Many users searches with this modifier on Google. So, this is good to use a modifier in the title and be front of your visitors. 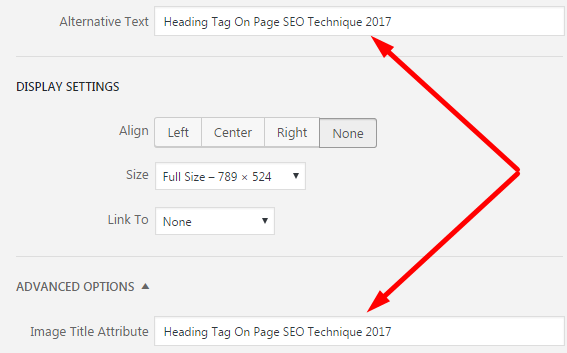 Next most important On Page SEO technique 2017 is Body tags. When you post your content, do break to your content into smaller sections or paragraphs to make it easier for your readers. You need to use this body tags in the proper way to get the advantage of SEO. You can manipulate your body title in H1, H2, H3, H4, H5, H6. Content only get rank on SERP but you can make it engaging by adding images, video, infographic etc. Only content make your reader bored. So make your content more interesting for your readers. Use related video, more informative infographics and images. This will help to reduce your bounce rate. You may notice that I used images here to make it easy to understand the point that wants to tell you. If you writing about blogging guide, use blogging guide in the first paragraph so that when search engine crawls your blog post you get ranking on “blogging guide” keyword. Keyword density means the percentage of times a keyword appears content compared to the total number of words in content. So, its very important to maintain keyword density in your content. If your content is 400 words and your targeted keyword appears 4 times in content, so your keyword density is 1%. If you are writing 1000 words article then you can use your keyword 10 times in the content. To avoid this keyword density, use LIS base keyword to make your keyword long tail. The more keywords that you use in content, the more it will be worth in the search engine eyes. It is very important to use the image in your content. When you use the image in your content make sure to add image alt tags. You can use a keyword as your image ALT tag. The benefits of using image ALT tags is when people search image related to your keyword they can easily find your image and they come to your web page or blog post. Including relevant keywords in image ALT tag can help a reader find your web page or blog post when searching on Google Images. Also, you can add Alt text and descriptions for your images, making them even more useful with SEO. When it comes for Internal Linking in the post, I deeply love with Wikipedia. Wikipedia uses internal linking in a great way. Internal linking means you are referring other post or the web page in the Google eyes. Internal linking is a greate weapon in SEO. It does not only make it much easier for your visitors to navigate around your blog post or web page and find all of your content, but it also ensures that your site gets properly crawled allowing the search engines to find all of your pages. There are the different way to interlink your old post or another post in your content like “Read more” “Also read this” “click to read more“. Recently google updated that mobile-first index on their official blog. This is the era of mobile and most people accessing the internet from a mobile device. If you have not mobile friendly webpage or blog then it possible to lose your mobile visitors. If your website not comfortable with mobile, your user never like your page. More than 75% user come from mobile device and to take advantage of the mobile device make your website mobile friendly. Outbound links mean to link page that not belong to your blog. This is best White hat SEO practice. When you do outbound links in your post, google thinks that your post is full of information and chance to rank higher. When you link to other website to your blog post, user think that you are providing quality information and it create trust in user mind. Sometimes it happens that page open fast in WiFi network but slowly open in mobile data and user jump to another website to find their answer. So, it’s very important to improve your web page or blog speed so that user easily open your post and read. User doesn’t want to wait till your page open and when a second time he/she search query, they will not even click on your page. So, keep testing your web page speed. If you want to test your web page or blog speed you can check here. When you do bold, italic and underline your keyword, it grabs attention of your readers. Search Engine also give some importance to this kind of keywords so make sure to use your keywords with this tags. 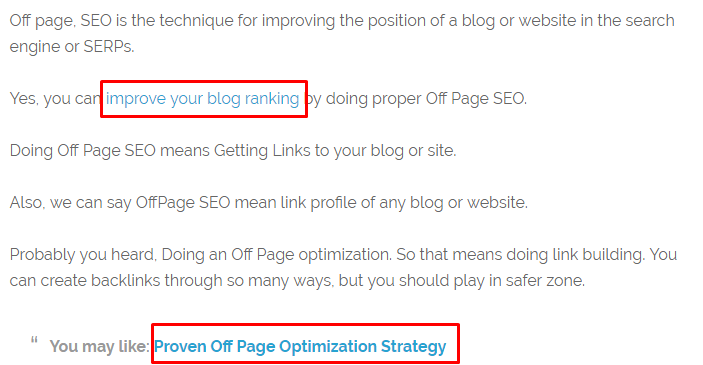 So, these are On Page SEO strategies 2017 you can use on your web page and blog. Along with this 14 on page technique, keep in mind that content is king. Write good quality content for your readers not for robots. So when you write content to focus on your readers. Jitendra Dabhi is the tech blogger of TechTipTrick. He is a passionate blogger and turned blogging into a money making ideas for smart passive income. He writes and shares about Technology, Android, iOS, Business, Startup, blogging and Tips and Trick. You are doing a great job, You have shared awesome seo techniques to rank any website in google serp. How to Be More Productive when Working from Home? How to Find a Wedding Photographer? How to Find a Good FBA Freight Forwarder? Is Your Mail Late because of USPS?